Whether you're a senior deciding on school options, a junior gearing up for the process, or a counselor immersed in it all, March has truly been madness. It's been crazy for us too, as we've been busy updating College Kickstart with fresh data, new financial aid ratings, a new help system and some polish based on your feedback. We’re data hounds and love the thrill of the hunt to find what you need to create well-balanced college lists and set realistic expectations. In recent weeks there's been a flurry of reported admissions stats from the institutions we cover, and we're happy to report that over 90 percent of our database is now on Class of 2019 data. As you know, we've also been actively tracking Class of 2020 results, so we'll begin to incorporate current year admission rates into College Kickstart in the weeks ahead. With the cost of attendance at institutions such as NYU now in excess of $70,000 per year, affordability is a crucial consideration to every college plan. That's why merit and need-based aid data is included in College Kickstart for our Premium Edition and College Kickstart for Counselors subscribers. The latest version of College Kickstart takes this one step further with the introduction of a new ratings system to help you compare the financial aid programs offered by each of the institutions on your list. For families with demonstrated financial need, it's a great directional guide to assess how well schools you're considering are likely to meet affordability constraints. For families without demonstrated need, it's a great way to identify schools with generous merit aid programs to take some of the edge off the cost of attendance. Need a little help or have a question? Check out our new Support and look for the Help button on every page. You’ll also find handy Getting Started guides for counselors and students. New application season column in the Requirements summary. We've added a new "Season" column to the Requirements summary to help you track whether an institution's application requirements are for the 2015-16 or 2016-17 application season. And while application requirements tend to be fairly stable from year to year, keep in mind that 2016-17 requirements won't be finalized until August for the schools we cover. New tips for Account Ownership. Counselors, we've added new tips for Account Ownership settings to make it clearer that when you are running scenarios on a student-powered plan, they are not saved to the student's plan. New tooltips for Early Admission. 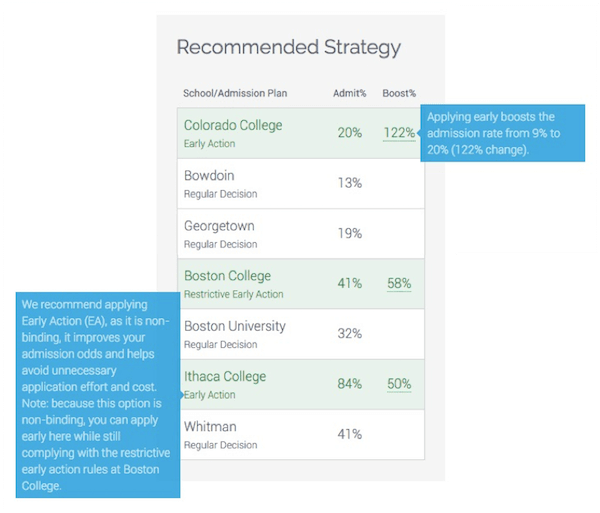 We've added tooltips to the Early Admission strategy graphic to better explain early admission "boost" and how we arrive at our strategy recommendations. Simply hover your mouse over the boost percentage (or tap if you're using a tablet) to see the early admission and regular decision admission rates used to calculate it. 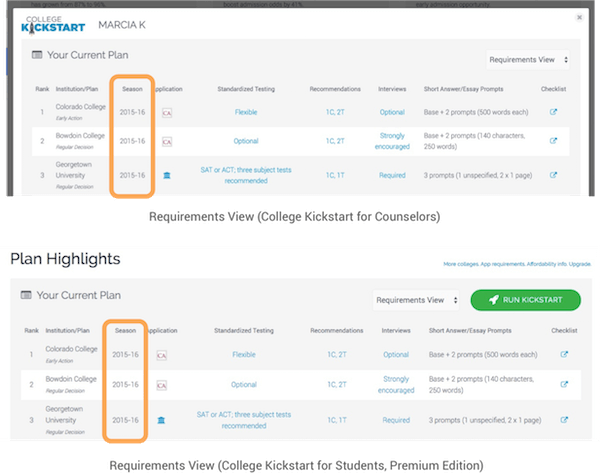 If you're interested in understanding how College Kickstart arrived at an admission plan recommendation, simply hover your mouse over the admission plan to see the explanation. When is it appropriate to use College Kickstart?